A watermelon, sweet and refreshing. Photo courtesy Watermelon.org. CAPSULE REPORT: Watermelon is an ancient and versatile fruit. It can be eaten fresh-sliced, grilled or diced; in salads; with cheese (it pairs well with feta and fresh goat cheese); and made into jams, jellies and juice to drink straight or in combination with other fruit juices and/or spirits. Watermelon juice can be made into soup and sorbet and served in numerous other ways. It can be fermented into watermelon beer, and is used to flavor liqueur, vodka and punch. This is Page 1 of a four-page article. Click on the black links below to visit other pages. 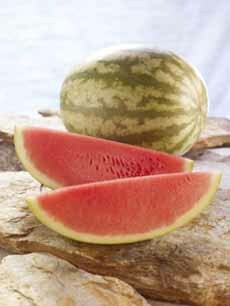 Watermelon, Citrullus lanatus, is believed to have originated in the Kalahari Desert in southern Africa (it covers much of Botswana and parts of Namibia and South Africa). 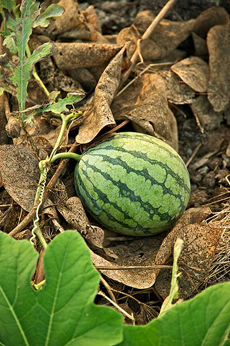 An ancestor of the modern watermelon still grows there. That ancestor was not tasty at all: bitter and with many seeds. It was cultivated for the water inside. 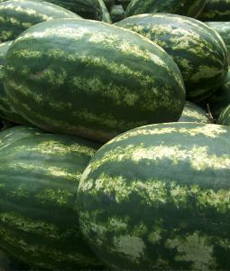 Watermelons are about 92% water—that’s how they got their name! In ancient times, travelers carried watermelons as a replacement for water—a watermelon canteen, as it were. Watermelon is a member of the botanical family Curcurbitaceae. Its cousins include cucumbers, gourds, pumpkins and squash. Watermelon has been cultivated as early as 2000 B.C.E. The first recorded watermelon harvest occurred nearly 5,000 years ago in Egypt. Watermelon seeds have been found in the tomb of Egyptian Pharaoh Tutankhamen, and in other sites of the 12th Egyptian Dynasty. Seeds and paintings of various species of watermelon have been found in Egyptian tombs dating back 4,000 years, and seeds dated 5,000 years old have been excavated in Libya (source). Over thousands of years of cultivation, mutations created the sweet flesh we enjoy today. Thirsty traders passing through the Kalahari, refreshed by the fruit, began to sell the seeds along the trade routes. Cultivation of watermelon spread throughout Africa. 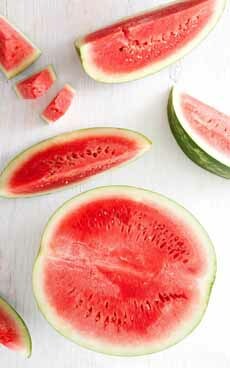 Watermelon was cultivated in China and other parts of Asia by the end of the 9th century C.E. or the early 10th century. Today China is the world’s number one producer of watermelon. Most culinary historians maintain that watermelon spread from Egypt to other Mediterranean basin countries on merchant trading ships. A watermelon growing in a patch. Photo by Fred Hsu | Wikimedia. After millennia of spitting seeds, “seedless” watermelons were developed in the 20th century. They’re not exactly seed-free, but the seeds have been made soft, white and easy to chew and swallow. Photo courtesy Good Eggs. The latest addition is the small, square watermelon grown by the Japanese to fit in their smaller refrigerators more easily. They’re created by placing the watermelons in a square tempered glass box while it is still growing on the vine. The boxes are the same size as the interiors of small Japanese refrigerators. As one might imagine, these labor-intensive square watermelons are priced at a premium—quotes of about $300 can be found. Watermelons come in a variety of shapes and sizes: Oval, round (above), even square! Photo by Aleksandr Milosevic | SXC. More than 1,200 varieties of watermelons are grown worldwide in 96 countries—some oval, some round, some with yellow flesh instead of red. Watermelons have been crossbred to yield more fruit and less rind, to have hardier rinds (easier to ship and store) and be disease- and pest-resistant. July is National Watermelon Month. 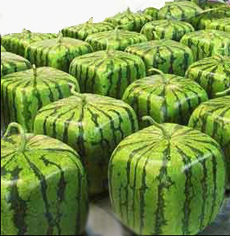 $300 a melon buys affluent Japanese a square that will fit into small refrigerators. Photo courtesy Wikimedia.